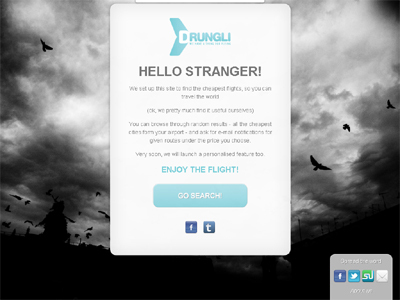 Drungli is the fastest search engine of low cost flights bringing you the cheapest random destinations available at any given moment. We want to surprise and inspire you to travel more and get your share of beautiful adventures all around the world. For now we cover Europe and part of Northern Africa, but we are working under the hood to bring you everywhere very soon.